Until July 6th, 2018, Siborg is offering a discount on LCR-Reader, LCR-Reader-MP, Smart Tweezers and other test devices in the LCR-Reader-Store. Siborg has begun offering the Smart Tweezers Offset Calibration Board in the LCR-Reader Store. This Calibration Board is a dummy PCB for actual offset values. The board uses holes that represent the size of components (0201, 0402, etc.). To find the offset of the component being tested, set the Smart Tweezers or Colibri to 10kHz and insert the tweezer tips into the holes of the corresponding component size. The device will show the actual offset capacitance value; this value can then be deducted from the value of the measured component. Previously, users had to approximate the size of the component with the tips and note the value. This method was inaccurate and unsuitable for high accuracy. The Offset Calibration Board is also useful for setting the automatic offset-subtraction value on Smart Tweezers models. The Smart Tweezers Offset Calibration Board is available in the LCR-Reader Store in all Smart Tweezers Plus and Pro kits, as well as on its own. Siborg is now offering a discount until the end of August on all multimeters, testers and accessories in the LCR-Reader store for students, educators and institutions. Discounts apply to quantities purchased. The sale will apply to LCR-Reader and Smart Tweezers LCR- and ESR-meters, including the Smart Tweezers Bluetooth models and LCR-Reader Pro Task Kits. 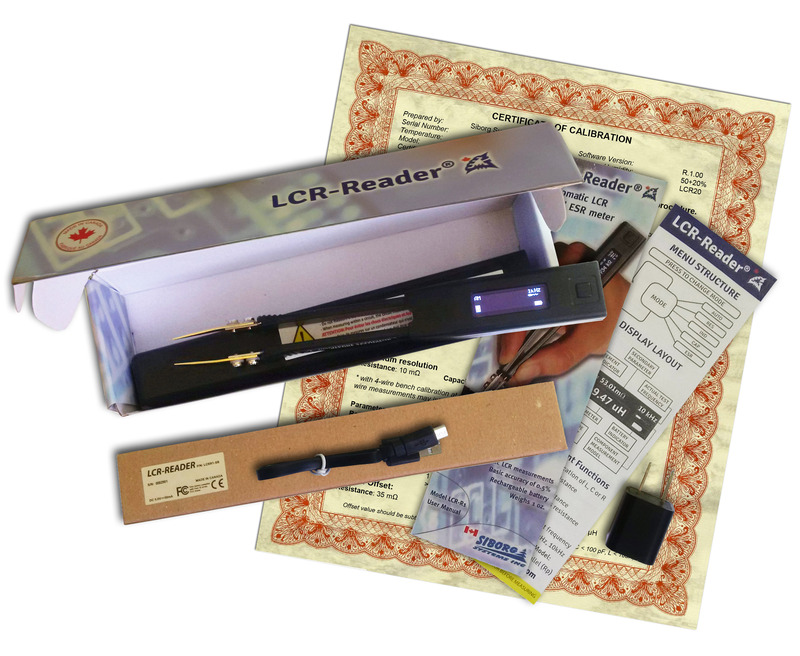 The LCR-Reader Pro Task Kit includes a calibrated LCR-Reader LCR- and ESR-meter, a set of bent tweezers probes, spare battery, and NIST traceable calibration certificate. Siborg also offers different task kits for both LCR-Reader and Smart Tweezers devices; each kit combines a different amount of accessories and the price reflects a discount opposed to buying each piece separately. Smart Tweezers Bluetooth has just been updated to include the ability to send device test signals to the Smart Twezers device. Previous models only allowed the device to send test results to PC or Apps for Android and iOS. This new update also allows the ability to set custom profiles from either previously measured values or from scratch. These profiles set a specific parameters for components to meet; when a component is measured, the receiving program either marks it as a pass or fail whether it met the parameters. LED Test Tweezers that test LEDs and other components using an 12 VDC output and adjustable current rating of 20, 10 and 5 mA. 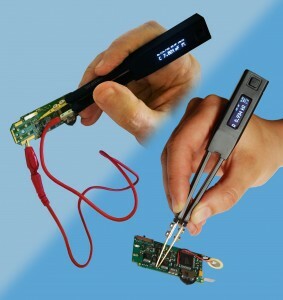 You can also use the device as a set of tweezer-probes for multimeters by connecting it using the included cable. SMD Multimeter Test Tweezers connect to most multimeters for tweezer-probe precision. 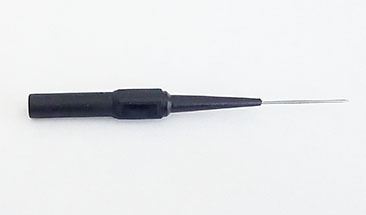 LCR-Reader/Smart Tweezers Kelvin Probe Connector is a shielded two-wire connector that allows Smart Tweezers and LCR-Reader devices be used as full probe stations and measure components larger than would fit between the tweezers’ probes. Siborg has recently added fine and extra-fine pin probes for use with the Kelvin Probe Connector. 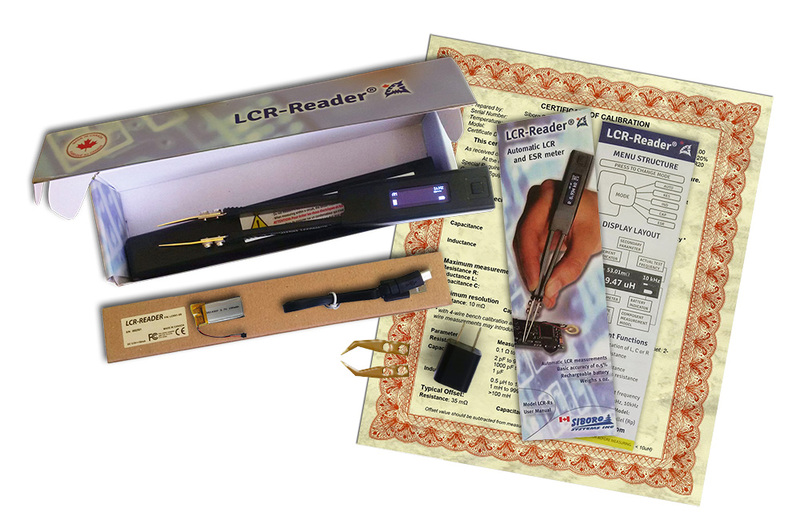 Students, educators and educational institutes to visit the LCR-Reader Store from March 28th to August 31st, 2017, to get a discount on all LCR-meters, SMD devices and accessories. To qualify for the discount, students are required to show valid school I.D, while teachers can ship to their institutions or provide a P.O number. Siborg has added new Fine and Extra-Fine Pin Probes for LCR-Reader/Smart Tweezers Kelvin Probe Connector in the LCR-Reader Store. There are two new available probes. Both Pin Probes connect using the 4 mm jack plugs included with the Kelvin Probe Connector. False measurements are when the device shows a measurement while not being in contact with a component. The device will stop showing a measurement value when the tips are removed. False measurements will cause the device to continue displaying a measurement and not turn off, leading to the battery being drained. Start by removing the tips and cleaning the arms with isopropyl and a soft cloth or gauze to remove any extra debris. Reinstall the tips to the device. If the device is still showing a reading, remove the tips and continue to step two. Try removing any excess flex cable from in or around the screw-holes. Gently rotate a drill bit by hand or use a Philips head screwdriver that is twice the size of the hole. This will scrape away any extra plastic and gold from the flex cable. The red circles in the image below shows where interference can occur. Sometimes bits of metal remain stuck in the threads from assembly. These bits can be removed using a tap or one of the screws to clear the threads. Tighten and remove a few times. Cleaning the screws may also help. Sometimes debris can be stuck between the threads. If all else fails, make sure there is no metal bits stuck under the flex cable around the screw holes. Very rarely does metal get between these two pieces, but it can create false measurements. Always try scraping away extra flex cable first. Use sharp tweezers to remove any visible metal pieces without tearing or damaging the flex cable. NOTE: Removing the flex cable will damage the glue and may cause issues when re-adhering the flex cable which can impact the accuracy of the measurements. Make sure to clean away any residual plastic or metal using isopropyl and a soft cloth or gauze before reinstalling the tips. If these steps do not remove the false readings, please contact Siborg Systems Inc.
Siborg is offering up to 20% off their Smart Tweezers and LCR-Reader devices and other SMD testing tools in the LCR-Reader Store and Amazon sales channels. The sale starts on January 18th at 12:00AM and ends on January 31st at 11:59 PM EST. 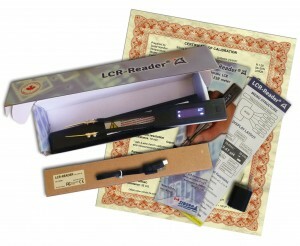 The sale includes LCR-Reader and Smart Tweezers devices, including Bluetooth model and task kits. Siborg is also offering a discount on LED Test Tweezers, Kelvin Probe Connector for Smart Twezers and LCR-Reader, and SMD Multimeter Test Tweezers. Visit the LCR-Reader Store or Amazon Sales Channels in USA, Canada, and Europe before January 31st for your chance to get up to 20% off! Starting December 26th, 2016 at 12:00 AM Siborg is offering a discount on LCR-Readers, Smart Tweezers and up to 20% off task kits in the LCR-Reader Store and Amazon Sales channels in USA, Canada and Europe. The sale will end at 11:59PM on December 31st. This sale includes the new LCR-Reader Pro Plus and Smart Tweezers Pro task kits that include the Kelvin Probe Station. Over the past year, Siborg worked with the Institute of Automation and Electrometry at the Russian Academy of Sciences in creating a new calibration fixture that could handle the complete range of measurements for both Smart Tweezers and LCR-Reader. After completion, Siborg sent the fixture to one of Canada’s leading calibration houses for verification. Once verified, Siborg was able to offer periodic calibration with certificate for LCR-Readers when the device and a certificate were purchased together in the LCR-Reader Store. Siborg also created new task kits, including the LCR-Reader Professional that included the certificate as well as spare bent tweezer-tips and an extra battery. Siborg is now offering NIST Traceable Calibration Certificates with every LCR-Reader without any extra cost. The lack of traceable periodic calibration was a hindrance for professionals that were looking for a tool like Smart Tweezers that offers a certificate, but did not agree with the high price. Siborg Systems Inc. has released a new product: the LCR-Reader Probe Station allows complete PCB probing and allows the device to measure components larger than would normally fit between the tweezers’ tips. The kit includes a 60 cm shielded two-wire connection with a small PCB on one end and a universal attachment for the seven included probe types (alligator clips, 4mm multimeter jacks, long and short pin-probes and a spade connector). The shielded two-wire connection virtually eliminates all parasitics due to the wires. 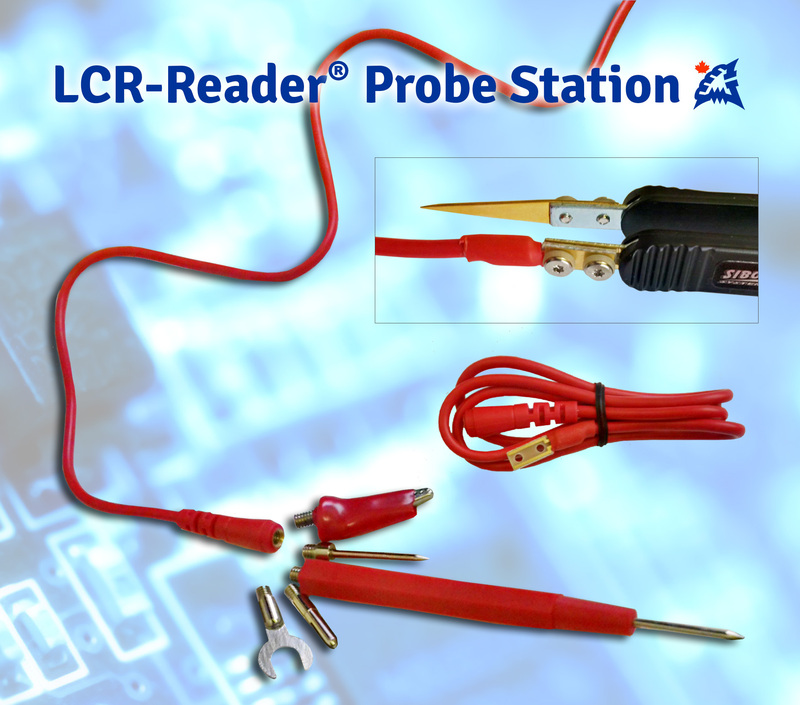 The Probe Station is also compatible with both LCR-Reader and Smart Tweezers devices. 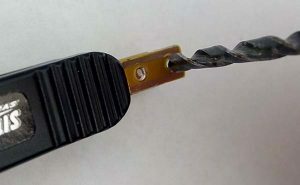 It is easy to connect and use; simply remove one of the gold-plated tweezer probes and replace with the flat end of the Probe Connector, making sure that the gold strips on the connector and device’s flex cable connect. Replace the screws, choose a probe attachment and begin measuring. This new product is available in the LCR-Reader Store for only $24.99 US.